Warning: If you haven’t seen the 6th season of Game of Thrones, stop reading now. Unless you like spoilers, then keep reading. 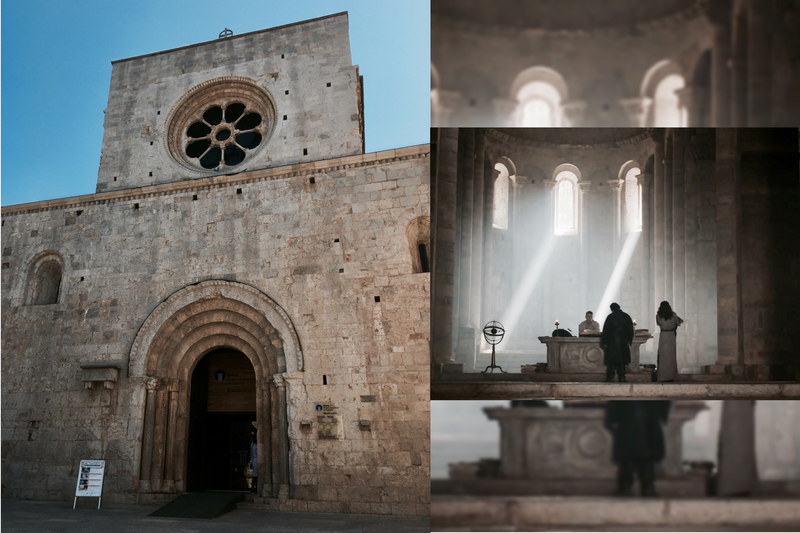 A few weeks ago, I decided to pay a visit to some Game of Thrones filming locations. 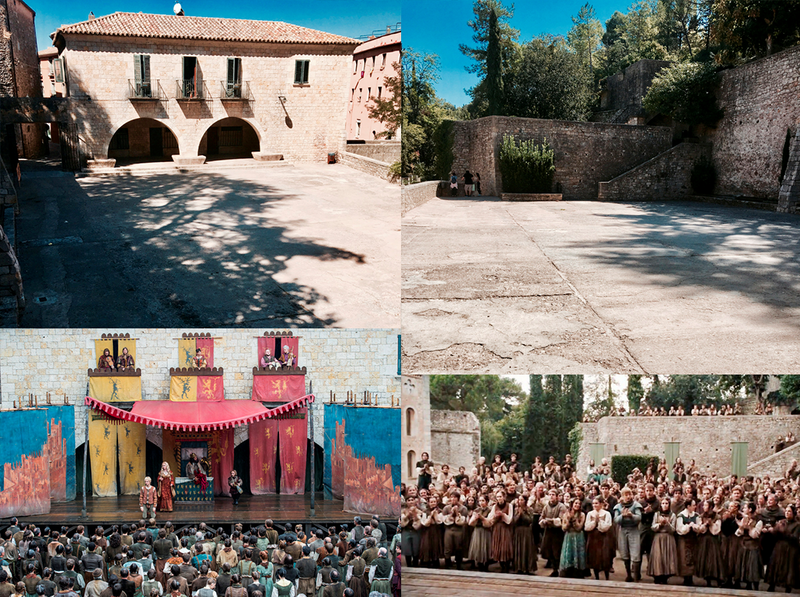 Many scenes from season six were filmed in Girona. It is a beautiful city with a lot of history and gorgeous buildings. And it’s only an hour away from Barcelona, so it’s perfect for a day trip. As a massive fan of this tv show, you can imagine how excited I was to be there. I had been in the city a fair amount of times before but none after it was used for Game of Thrones. So, let me talk you through the places where they filmed some scenes. I’m gonna follow the episodes order so you can follow the storyline of the show. Also, unlike in the tv show, in real life, most of this places are so close to one another since most of them were filmed in the old town’s centre. In this episode, Girona stands in for Braavos. The place where Arya Stark was at the time. She is seen begging in the streets and being attacked by the Waif for the first time. This was filmed right behind Girona’s Cathedral, on a small street with stairs. 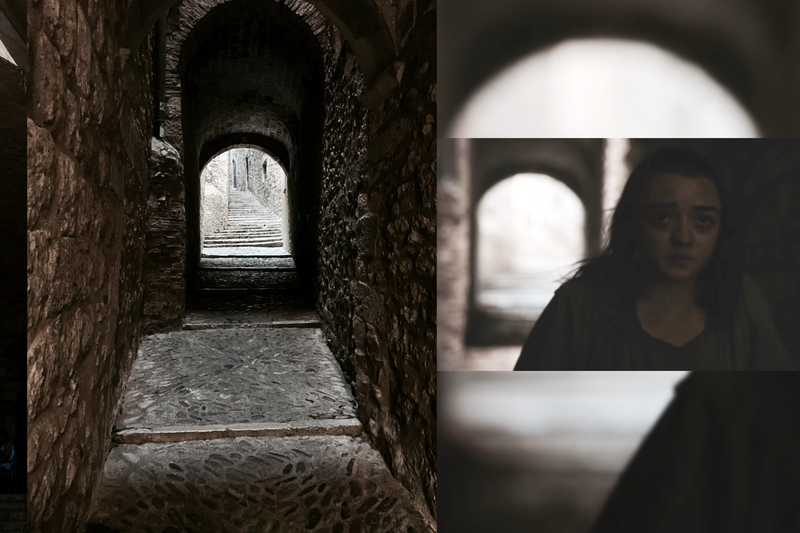 In this episode, we see how the Waif comes back to attack Arya in the same spot from the previous episode. Later Jaqen H'ghar, a member of the Faceless Men, appears to ask Arya some questions, offering her to give her her sight back if she tells him who she is. He expects her to answer “a girl has no name” and since she does, he asks her to follow him (to the House of Black and White). 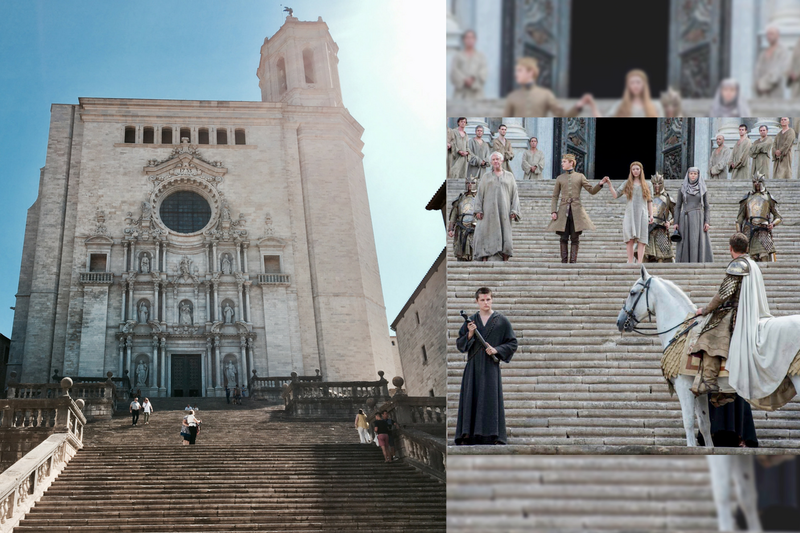 A Girona square stands in for the Braavos theatre in this episode. In the scene, Arya is amused watching a parody play that follows the story of the Lannister family but isn’t so happy when there’s a parody of her dad’s death, which wasn’t so pleasing as you probably remember. Now, here’s the most recognisable building in Girona. 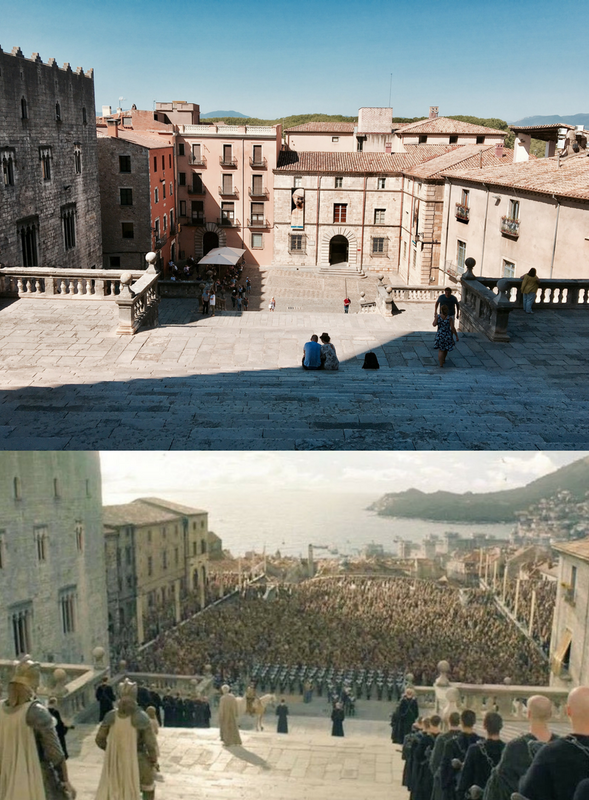 This time though, instead of Braavos, the city stands in for King’s Landing. More specifically the building is used as the facade of the Sept of Baleor (the one that explodes later in the season) and it also features the famous Cathedral’s steps. In the scene, we see the High Sparrow with Margaery Tyrell who has to do the walk of atonement. Later on, Jaime Lannister arrives with the Tyrell soldiers and goes up the stairs on horseback. In this episode, Arya books her passage out of Braavos. I didn’t go to the place that stands in for the market but it’s very close to the square they used in episode 5. Later on, Arya is seen on a small bridge looking at the sunset when she is suddenly attacked and stabbed by an old lady, who is actually the Waif. This location is also right next to the square in episode 5. Again, this episode has a chase and a fight between Arya and the Waif. 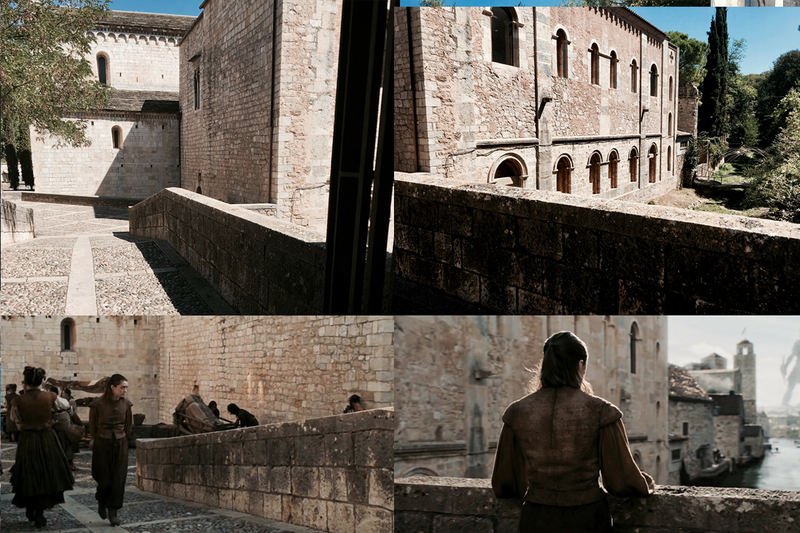 During the chase, we can see Girona’s Arab Baths (I didn’t go there but they are right in front of the location used as the market in the previous episode). 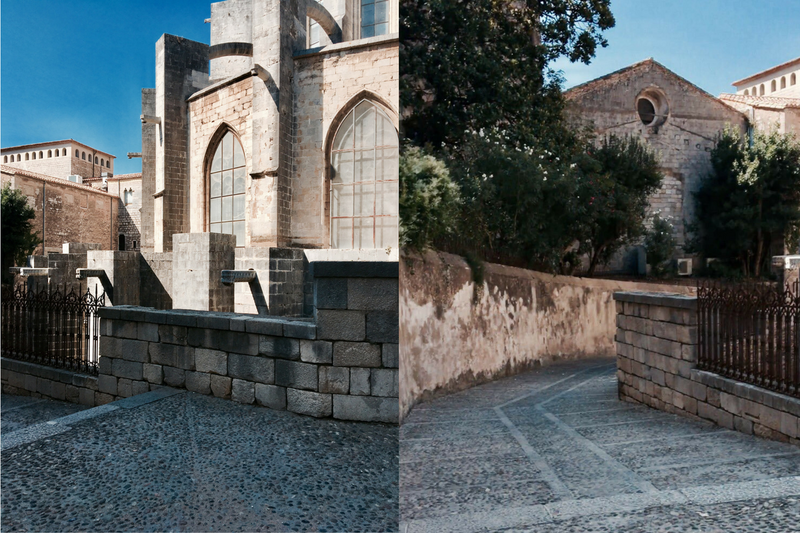 You can also see another quite known Girona landmark, the Sant Martí and Sant Domenec steps, this one is a few minutes away from the Cathedral. 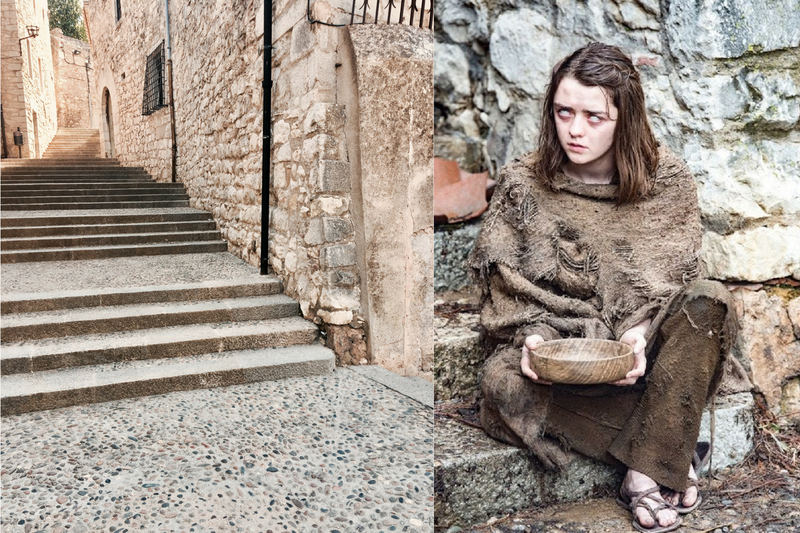 In the tv show scene, Arya jumps from the top of the stairs and tumbles down and falls on top of some oranges. Then she quickly escapes before the Waif follows her again and she makes her way through some small streets. One of them is also close the Cathedral, before the steps I’ve just mentioned actually. You just have to follow a street that’s to the right of the Cathedral (looking at it from the bottom of its steps) and eventually to your right you will see a narrow dark alley that was briefly used in the chase scene. And if you keep walking you’ll get to the Sant Martí steps. 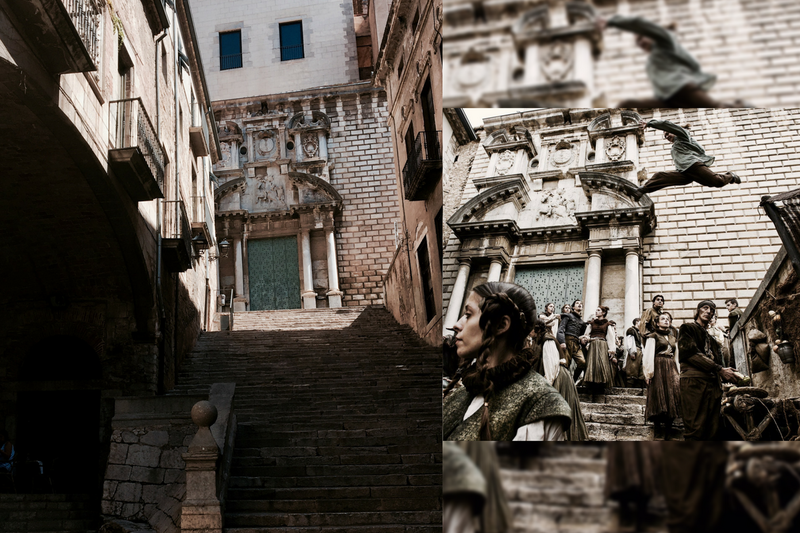 Episode 9 doesn’t have any scenes filmed in Girona either (because it was the Battle of the Bastards and it didn’t happen in any of those locations). Like I’ve mentioned earlier, the Sept of Baelor blew up in this episode. Cersei made this happen and everyone inside died, including Margaery Tyrell and the High Sparrow. I’m still not over Margaery’s death, she deserved so much better, her whole house deserved so much better. However, in this episode, Girona also stands in for Oldtown. The inside of one of Girona’s buildings, the monastery of Sant Pere de Galligants, is used as the citadel, the place where the Maesters are trained. You can see it in the scene where Samwell, Gilly and their baby approach a Maester that’s sitting behind a tiny desk. I didn’t go inside but I’ve been there before and it does look quite similar than in the tv show. So this is it, there are a few more places that I didn't go to like I've said but I think you can get an idea. Actually, if you aren’t familiar with any of these places, you probably wouldn’t recognise them in the tv show, since obviously there’s a lot of post-production work. They also had to edit out modern stuff like street lights, or pipes and also religious things like the statues from the Cathedral’s facade. 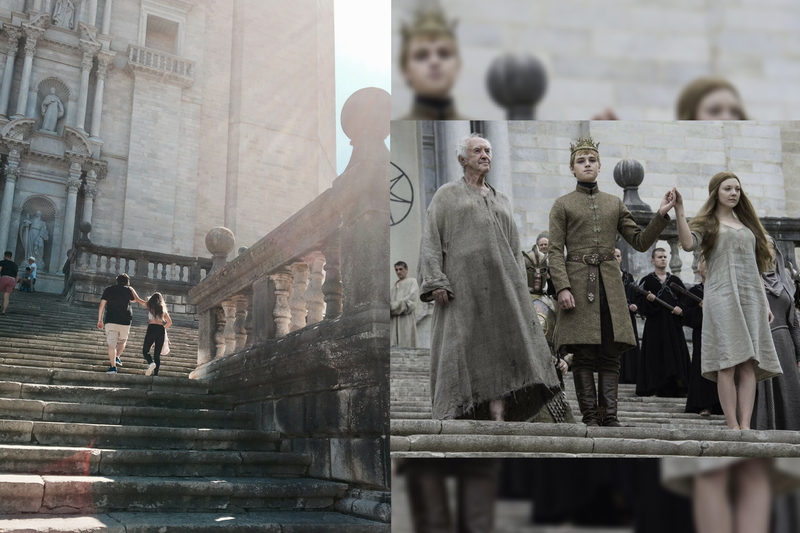 They also had to make it look as if the Sept of Baelor was close to the sea (because it’s King’s Landing) when in real life there’s only a small square at the bottom of the steps and the city is not close to the sea at all. I hope you enjoyed reading this post as much as I enjoyed visiting these places and writing about it. 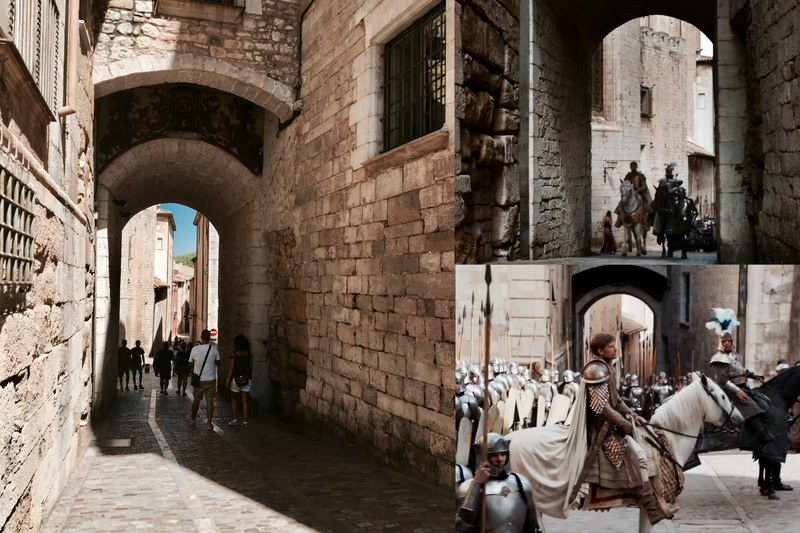 If you are a Game of Thrones fan and one day go to Girona, make sure to visit these places. And if you aren't a Game of Thrones fan, I'd still very much recommend visiting it. It's such a beautiful place and if the weather is nice you'll have such a great time just walking around the small streets. Make sure to try some local food as well! !